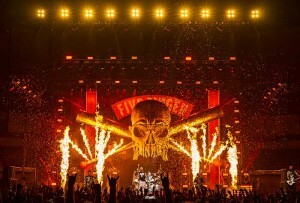 Yet, for all its wrecking ball ferocity, the legendary metal band is famous for forging close emotional connections to fans at its shows. This was very evident on their recently completed arena/amphitheatre tour with Breaking Benjamin, which featured memorable sing-alongs accented by warm audience lighting from Chauvet Professional Strike 4 fixtures, supplied by Christie Lites. 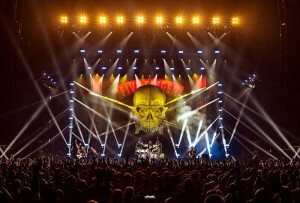 John Santos, the lighting designer for Five Finger Death Punch, had ten of the high-output LED Strike 4 fixtures spread out evenly on downstage truss during the tour, which ended in mid-December.